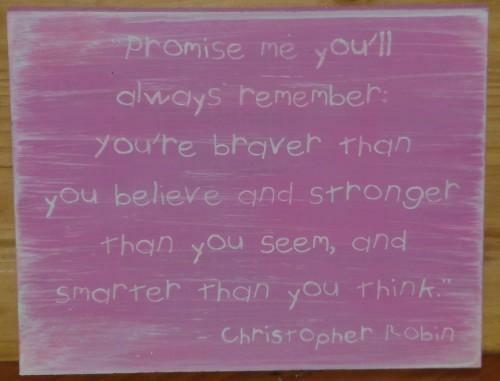 For your consideration is this handpainted by me Primitive Winnie the Pooh wood sign. It measures 9" x 12" and is painted pink in premium acrylics. The lettering is painted in Icy White and reads " Promise me you'll always remember: You're braver than you you believe and stronger than you seem, and smarter than you think." Christopher Robin. This is a very whimsical sign that would be delightful in a nursery or anywhere some inspiration would be appreciated! It would make a wonderful gift. I have aged it to give it an olde worn look and glazed it for durability. It will fly to you signed and dated by me. 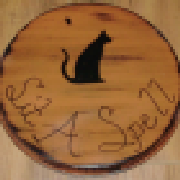 Remember that I love to do custom work and this sign can be made in any colors you like.